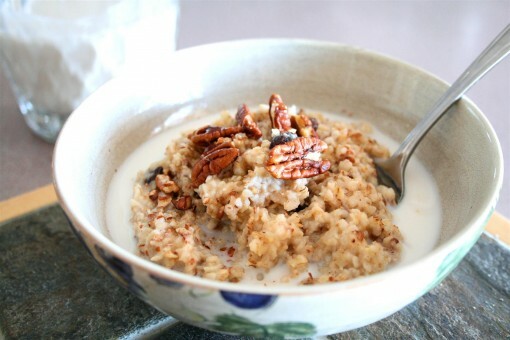 Charissa’s Favourite Oatmeal was posted on July 29th, 2011 and is filed under Breakfast, Gluten Free, Recipes. This entry has 10 comments. You can follow any responses through the RSS 2.0 Comment Feed. Hey guys! I thought today it would be fun to share one of my favourite breakfasts with you! I don’t know about you, but breakfast is my ultimate favourite meal in the world. I could eat it all day. You know, pancakes and eggs for supper, smoothies for lunch, fruit for all day snacking, and oatmeal for breakfast. Oh, and cold cereal for midnight munching. That’d be awesome! So this is what I had this morning and it’s my favourite way to eat my oats! 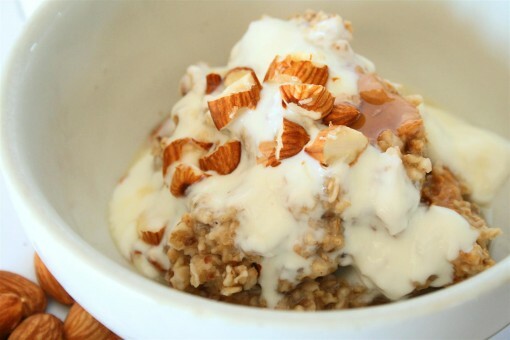 I like to make my oatmeal a complete meal by adding some extras that up the protein and add some healthy fats. This serves 1. Cook up your oatmeal with the water. Once thick, stir in your PB, wheat germ, and flaxseed. 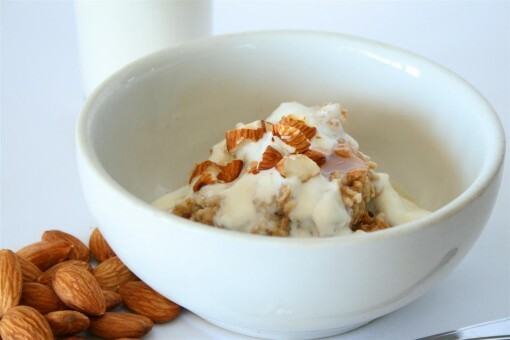 Spoon your oats into a pretty bowl and top it with yogurt (stir in 1 packet of Truvia first), maple syrup, and almond bits. Serve with homemade almond milk! Quick, easy, and SO SO SO delish! I almost always have my oatmeal this way…which probably means that I should branch out! I love almonds! 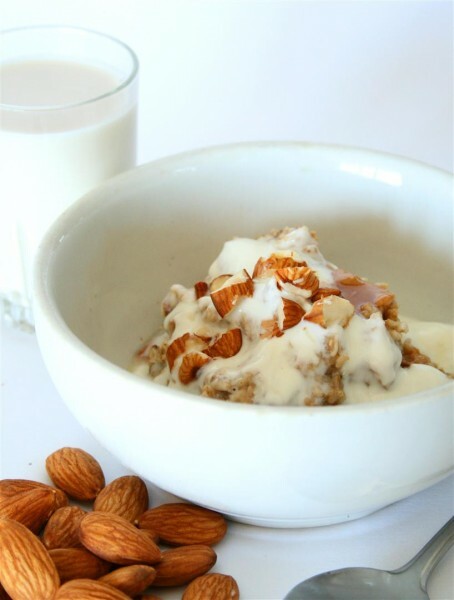 Did you know that 10 almonds have 2.5g of protein! But when you’re snacking beware of the calories…even though almonds are super nutrient dense they have a good amount of calories. 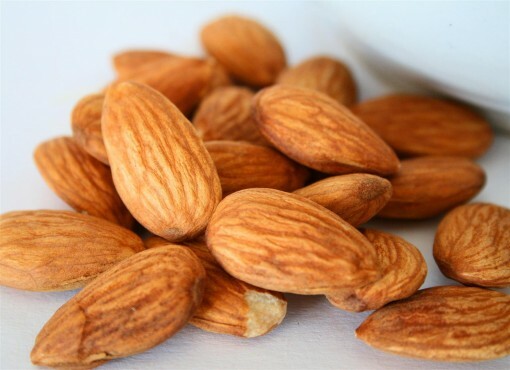 Those 10 almonds have 69 calories…but if you pair that with an apple (50-70 cals) you have the perfect protein/carb based snack for under 150 calories! That’s a much better choice than those little 100 calorie snack packs! I also paired this breakfast with a small green smoothie made with kale, almond milk, strawberries and all sorts of good stuff! Check out this recipe from a Jane at Eye It To Try It so you can make it too! It’s good, believe me…this is the second day in a row I’ve had it for breaky! Only today it was actually shared! Oh, and check out Kelly’s site Eat Yourself Skinny! She had me on for a guest post today which is such fun! She has a great site so go and see what’s up! Are you a breakfast person? How do you like to eat your oatmeal? I make a hot breakfast just about every day of the week. We eat a lot of oatmeal and we like it best baked, so that happens at least once a week. I made it with dried apples and cranberries today and it was delicious! That looks healthy and super delicious. I skip breakfast most weekdays .. but weekends I need a heavy long breakfast time. Podobnie jak ty uwielbiam śniadania i płatki owsiane często u mnie goszczą;) piękna miseczka! Those almonds are just too beautiful. I just picked up a huge bag at the bulk section of Whole Foods. I love almonds in my oats! I am going camping this weekend and I am planning to eat overnight oats with almond milk, dried fruit and some chopped almonds!! I haven’t tried oatmeal with PB. I’m going to give your version a try. Maybe this morning!